Ramp up your party with this banger! Eight years after Scooter wedged themselves into the European dance music scene, it was time for something new, something invigorating to make the masses know their name. Scooter had achieved great success in their home country of Germany and surrounding nations, but worldwide, they just couldn't grasp that popularity, most notably in the nearby United Kingdom, where they had, at best, hit #18 on the charts in 1995. And overseas, they were even less recognized. 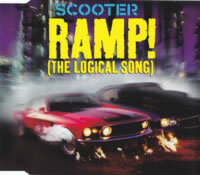 But that all changed, thanks to one little song: "Ramp! (The Logical Song)". The Extended Mix is, as always, the full-length version of the song, adding some extra beats at the beginning and end, but very little else. There's also a Club Mix that removes H.P. 's vocals, leaving behind only the high-pitched Supertramp chorus and the regular instrumental portions, changing the buildup as well. Audiophiles are also treated to the B-Side, Siberia, a somber affair featuring chilling female wailing and deep drum beats. I'll admit that Ramp! is definitely a commercial production. Though all the pieces are there of a typical Scooter track, it's hardly the unique experience that they normally offer. That being said, Ramp! is an easy introduction to the group, as it is one, if not the most, popular track worldwide in their discography, plus it's pretty easy to dance to!